Ford, with the help of some tech transfer from the GT and Mustang GT4 racing programs, has built an absolute track-scorcher in the form of the 2020 Mustang Shelby GT500. The veil has officially been lifted off the 2020 Mustang Shelby GT500 at the ongoing Detroit Motor Show and we are happy to report that the end-product has definitely been worth the wait! Just to give some of the astonishing numbers associated with this car, Ford claims that the new GT500 can hit the 100km/h mark in less than 4 seconds and comes fitted with 420mm Brembo dual-rotor brakes with larger, six-piston callipers. The 2020 Mustang Shelby GT500 is powered by a hand-built supercharged 5.2-litre aluminium alloy engine built by hand. In order to give the intake air cooler a lower centre of gravity, Ford went all the way to use an inverted 2.65-litre roots-type supercharger with an air-to-liquid intercooler placed in the valley of the V8 block. Like the Shelby GT350, the aluminium engine block in the GT500 also makes use of weight-saving wire-arc cylinder liners and high-flow aluminium cylinder heads for better lubrication. To channel power and torque to a unique carbon fibre driveshaft, Ford has given the new GT500 a Tremec 7-speed dual-clutch transmission which is a first for any Shelby GT500 produced till date. Ford claims that with a setup similar to the GT's DCT box, the GT500 is capable of shifts in under 100 milliseconds. 'With its supercar-level powertrain, the all-new Shelby GT500 takes the sixth-generation Mustang to a performance level once reserved only for exotics,' said Hermann Salenbauch, Global Director, Ford Performance vehicle programs. 'As a Mustang, it has to be attainable and punch above its weight. To that end, we’ve set a new standard among American performance cars with our most powerful street-legal V8 engine to date, plus the quickest-shifting transmission ever in a Mustang for all-out precision and speed,' he added. In terms of design, the Shelby GT500 gets large, angular grille openings and fighter-jet inspired muscular bonnet. 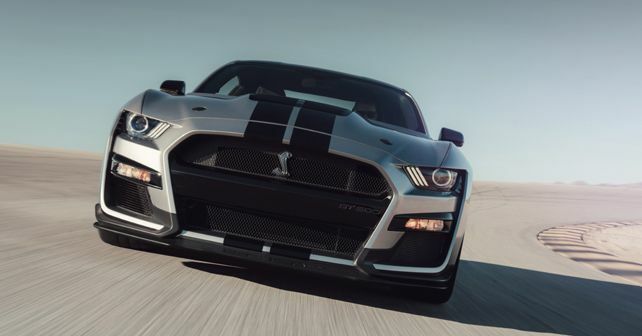 Ford claims that the front fascia openings on the GT500 are more than doubled versus its stablemate, the Shelby GT350, while six heat exchangers are stuffed in to increase cooling pack airflow by more than 50%. On the inside, notable additions include a 12-inch full-colour LCD instrument cluster and custom-tuned 12-speaker B&O Play premium audio system. The infotainment system is controlled via an 8-inch Sync3 touchscreen. While Ford has confirmed that the new GT500 will be reaching international dealerships by the end of this year, an official launch date and prices are yet to be revealed.